Advanced driver assistance systems nowadays move on from single-purpose functions to integrated automated driving as showcased in functions such as “Distronic plus” (automated driving in stop-and-go situations) or even fully automated highway driving. In parallel, cooperative functions are getting closer to market introduction, proving technical maturity and effects on traffic safety and efficiency in Field-operational Trials such as simTD or DRIVE C2X. The cooperative driving group of Fraunhofer FOKUS aims to adapt cooperation into novel driver assistance systems, by combining experience from fields of research and development. 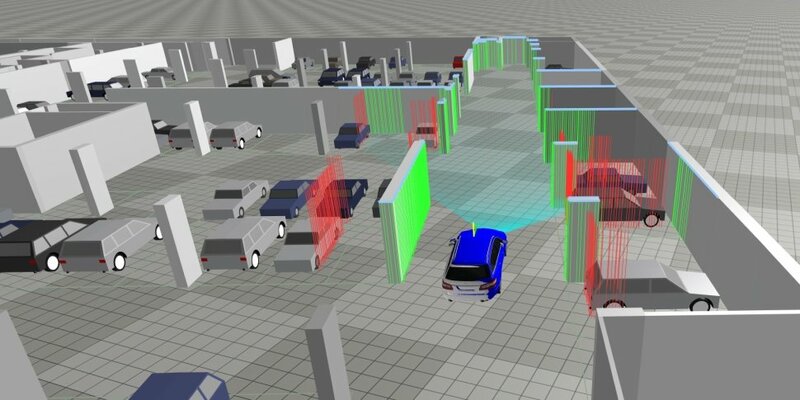 Communication offers novel insights to driver assistance, that no other sensor can provide: a look “inside” other vehicles. As such it is possible to share knowledge, intentions and maps between vehicles. These local dynamic maps enable vehicles to “see around the corner” or even beyond sensor range with multi-hop communication. Intelligent integration of cellular communication allows to share aggregated knowledge even further. High-automated vehicles and autonomous vehicles can go one step further: by communicating these vehicles can negotiate and conduct cooperative driving maneuvers. Constraints such as low-penetration rates, reliability, security and trust in wireless communication are key factors for feasibility of these functions. The investigation and prototyping of such novel applications is in the focus of the cooperative driver assistance systems group. High-precision digital maps are a key requirement for all current high-automated and autonomous vehicles. These maps are created initially as 3D high resolution scan and provide landmarks for localization and attributes for driving behavior – but roads and road properties change over time! By combining the distributed knowledge of the highly automated vehicles driving on these roads, a cooperative adaptive map service can be created – combining precision and timeliness of information. Fraunhofer FOKUS is working with industry leaders on creation of these state-of-the-art adaptive map services. 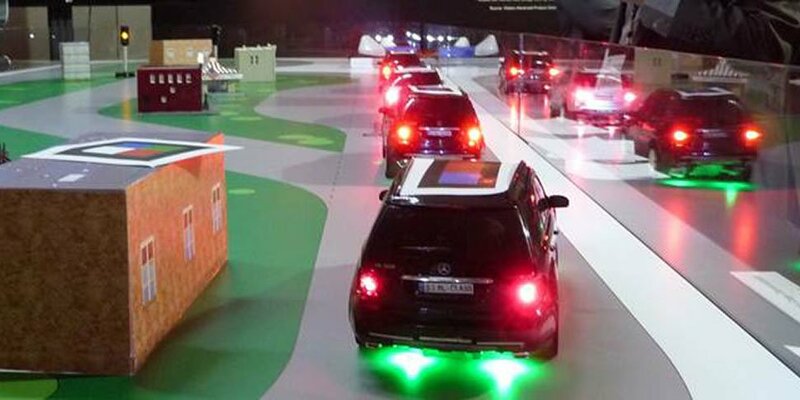 The Fraunhofer 1:18 autonomous driving testbed uses proprietary technology to program and control sophisticated model cars on a 1:18 scale track. The vehicles are fully autonomous and are programmed to perform a number of functions. They serve to test new function ideas in a safe environment with quick turnaround times and low effort. Also, the model cars have proven to be impressive eye-catchers at exhibitions – drawing in a crowd and showcasing novel functions in a way that anybody can understand. The vehicles combine cooperative driving functions with autonomous vehicle control. Thus, real-world applications such as “Electronic Emergency Brake-Light” are transmitted over ETSI messages and following vehicles can directly act on this information. Currently over 10 different functions from day1 cooperative use-cases up to platooning and autonomous car-sharing have been successfully implemented. An integrated control server serves as master control, letting the operator or moderator issue commands to all vehicles simultaneously with a press of the button. The track itself can also be equipped to function similar to tomorrow’s real world applications. The traffic lights are programmed to send out state-of-the-art ETSI I2V messages containing topology and signal phase and timings. Thus, vehicles can automatically adapt their speed to get an automated green wave. A special area is equipped with wireless charging – thus, vehicles with low batteries can enter these spots to recharge their main battery, much like real electric vehicles might be able to in the future. The track features an integrated positioning system based on computer vision to locate the vehicles up to millimeter precision. This information is sent wirelessly to vehicles to serve as GNSS replacement. Different tracks from 1*2m to 7*2m have been successfully showcased at exhibitions – and tracks can be extended as large as necessary.